Join us for an overview of what bromeliads are, how and where they live and a better understanding of how we can use them in our gardens and conservatories. Bromeliads are found only in the New World and occur in the U.S. from Virginia along the coast to Texas and in all other countries from Mexico, Central America, South America and the Caribbean and even the Galapagos Islands. Extremely adaptable; bromeliads fill nearly every niche over their range and from sea level to above 12,000 feet. 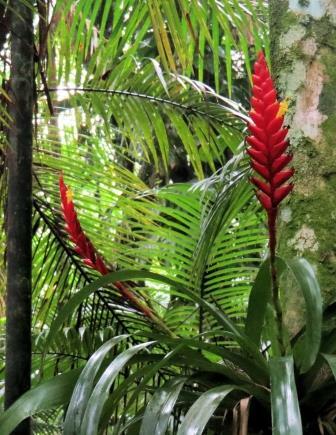 The greatest majority of bromeliad species occur in the tropics, however they also occur in sub-tropical areas such as Florida where there are 23 different species. Bromeliads sizes vary from under an inch to over a ton and 25 feet tall. They live in sun, shade, rainless deserts, cloud forests and some are even rheophytes; plants that live part of their lives in or under water! Amazing diversity of plant forms (think Pineapple and Spanish Moss, both are bromeliads!) and seemingly limitless adaptations to special habitats make bromeliads fascinating to study and beautiful to look at. 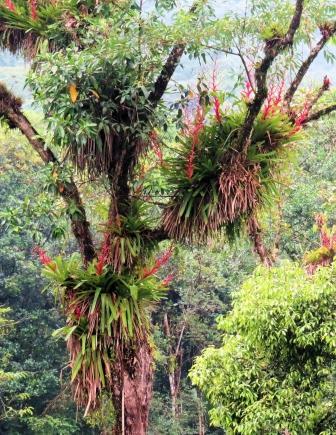 Bromeliads are key elements in their natural environments and serve many functions in the natural ecology of a region. Many provide water storage where animals can live or breed or find water to drink in areas well above ground level. Some provide shelter for many creatures and some provide food sources. A number of animal species are endemic to the tanks of bromeliads and even a few other plant species are only found growing in bromeliads. There are several species of plants which require the tanks of bromeliads in which to germinate their seeds and their survival is dependent upon them. Our speaker, Dennis Cathart of Tropiflora Nursery, started Tropiflora in the early '70s as an outgrowth of a bromeliad collecting hobby. A "hobby gone bad" he says. Following years of collecting reptiles and traveling the Caribbean and Latin America, he discovered bromeliads or they discovered him and the direction of his life was changed forever. Collecting and exploring in the plant world were always his first interests and over the years he has visited over 25 countries on more than 100 trips and expeditions. With his partner, Linda, together they have made travel, adventure, plant exploring, speaking, writing and the nursery business a way of life. He and Linda are now passing their passion for plants on to their children, to take Tropiflora into the second generation.